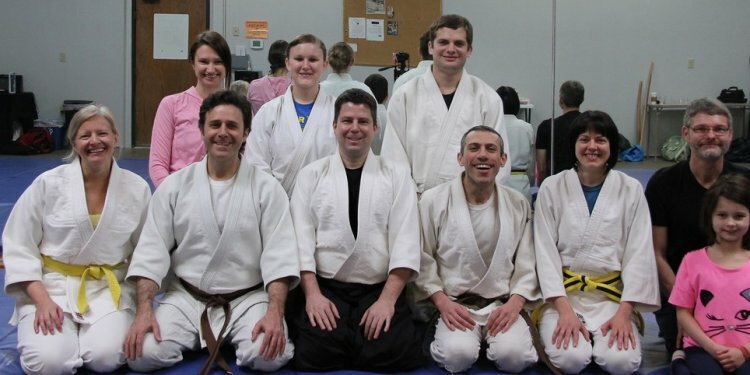 Facing physical, mental, and spiritual challenges, the Aikido practitioner gains positive physical aspects such as strength, muscle tone, stamina, etc. He gains mental discipline and strength that manifests in ways such as confidence, perseverance, and commitment. As a child is said to be free and on his own after his physical and mental abilities have matured, the same can be said of the experienced Aikido practitioner who naturally craves to venture towards finding his own spiritual path after these fundamental stages of development are accomplished. Theory without practice is useless. Practice without theory is dangerous. In Aikido training these two opposite forces balance each other out in the individual thus creating a harmonious and joyous transformational experience. Aikido is a traditional Japanese martial art. The founder of Aikido, Morihei Ueshiba (O'Sensei) was born in Japan in 1883. After mastering classical styles of Judo, Kendo, and Jiu Jitsu, he created Aikido, an entirely original martial art. He is rightly known as one of the world's greatest martial artists for his creation of Aikido, the synthesis of his superb technique and his profound spiritual insight into the nature of the universe. Although a great defensive system, Aikido is much more than just another fighting style. It is a holistic approach to life that O'Sensei described as "a divine path inspired by heaven that leads to truth, goodness, and beauty." Aikido body art techniques can be traced back to the times of feudal Japan. Techniques developed and were refined while the combat was empty handed or armed. In Aikido training there is no clear distinction between empty handed combat and armed combat. The Bokken, Jo, Tanto and hands are relative extensions but not limited to that of the body. Training with these different relative extensions offers the student unique perspectives into timing, distance and other practical insights. Zazen “seated meditation” is considered the heart of Zen Buddhist practice. The aim of zazen is just sitting, suspending all judgmental thinking and letting words, ideas, images and thoughts pass by without getting involved or attached in them. Through this meditative discipline practitioners learn to strengthen their body and mind and experience insights into their own nature of existence. For the uninitiated who begins Aikido training, this Zen aspect that is incorporated in martial arts appears contradictive and confusing. After all, martial arts are supposed to belong in the realm of destruction. However, through this seemingly antagonistic dynamic, the student comes into contact with his innermost formidable enemy. The essence of Budo is discovered on this internal infinite battlefield. Iai-Do is essentially a noncombative physical and mental discipline based on a prescribed use of the traditional Japanese sword (katana). Like any truly classical Budo form, Iai-do is an endless pursuit, not a reachable destination. The student is dedicated to the idea the he will maintain a beginners mind everyday of his life and that he must train as long as he lives.